Late-breaking story - Ex-Presidential Bicycling Cardio-Doc Shot by Deep-State "fellow" Cyclist? Yeah, it's late breaking alright. Here at the Peak Stupidity blog, "late-breaking" simply means we we're late in breaking the story. Actually, we're not breaking anything, just really wondering about this 3-week old story out of Houston, Texas. Now, as stated previously, at least once, Peak Stupidity does not subscribe to the long-term, say centuries-scale conspiracy theories. The shorter term stuff is another story. We just got done writing about the part-time conspiracy-theorist Alex Jones' censorship by Big-Social-Media. (It's not that the censorship was any kind of conspiracy - just perfectly obvious standard tactics of the ctrl-left). Continuing in this topic, let's look at a story that, after reading some of the details, I can't see WOULDN'T BE some type of conspiracy, or just plain Deep State nefariousness. Dr. HausKnecht, a Houston Cardiologist was shot while riding his bicycle by another cyclist. Now, I bolded that because this very nearly proves that this was not a road-rage hot-blooded act. I know about cycling, and I can tell you that most the road rage involved goes in the bike-on-car direction, with a decent amount of car-on-bike (yeah, drivers can be assholes). The thing is that cyclists are a) vulnerable to injury and death from cars, b) pumped up from working out, and c) damn tired of all the fool drivers concentrating on their artificial stupidity versus looking out the windows of their vehicles, or just being incompetent. People may wonder where those deep scratches from tire pumps on the rear panels came from - give us some room, and it won't be a problem. Rant concluded, let me say that this story was very strange, as the doctor was shot while riding his bike by another guy riding. In general, cyclists give each other lots of courtesy, just as motorcyclists do. Oh, how about a simple robbery, one may ask. Really, how much money and stuff does a bicyclist usually carry, though? I don't think stopping would be my first reaction were a guy to pull a weapon on me while riding. Anyway, in this case, the man took a couple of shots, which killed the doctor, and rode off. 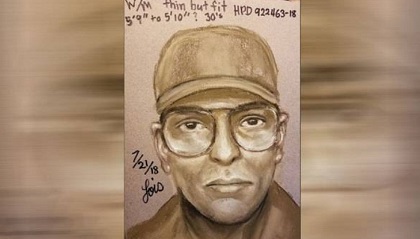 Wait, maybe the killer knew the victim, and this was a cold-blooded murder, a result of some feud perhaps? Sure, it was cold-blooded alright, but it seems planned out almost too well for someone who'd take a disagreement to this level. Is this case weird because the man was an esteemed cardiologist? No, that's not my point in writing this post. Doctors have accidents, or get sick, and die like everyone else. They may be bright people in general, but they do a lot, (sometimes more, due to having lots of money) stupid things as the rest of us too. Now, this wasn't stupidity in any way, but I just want to emphasize that, sure, stuff happens. Being shot while riding a bike, BY a bicyclist, though, is not something that happens often to anyone, as I recollect. Dr. HausKnecht (thank you copy/paste!) 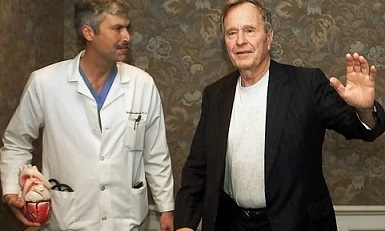 had been the cardiologist that treated ex-president George H.W. Bush for, (yeah, you guessed it) heart problems. That could have been no factor in this shooting, were it a "normal" type of killing ("he was a good boy, didn't mean to do nuttin"), but this one has no normal motive, what I was getting at in the last couple of paragraphs. In this case, because of that connection to a man who is about as much a representative of the Deep State as anyone there is, you really gotta wonder about it. What did ex-CIA-chief Bush tell this guy while under some anesthesia for a catheter or stent? (No, you don't have to be out, but they give patients some pain relief if requested)? According to the news story linked-to above, Dr. HausKnecht had great bed-side manner, and could easily unintentionally have learned lots from Mr. Deep State. It really comes down to the bicycle. That is an ideal way to keep from being tracked during a crime. The key is that bicycles don't have plates, registration, and all that Police State jazz that most other vehicles do. Yeah, the plates used to be about auto theft, but it's all about keeping track of people now ... pretty well, I might add. The white ball-cap-donning gentleman(?) that made the, uhh, hit could just come with the bike from somewhere without cameras around do the deed, and take off (as he did) with no tracking. He may have just thrown the bike in a ditch in a field. Cut the tires, and tear up some spokes, and it'll sit there for years until it's rusted to nothing. With an organization behind him, whatever that might have been, this could have been arranged to be very hard to trace. It may be that the Peak Stupidity staff is just more criminal-minded than the average blog, but this is the way I'd go about it, were I a member in good standing of the Deep State assassination bureau. Spooks on bikes, hell of an idea, and it's easy on the black budget, a win/win .. except for honest Americans.